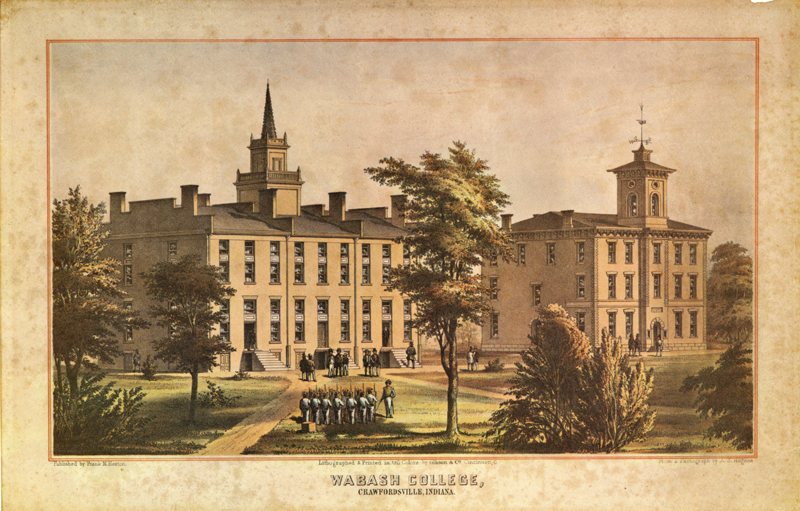 This is taken from the 1857 lithograph of the College. A very large copy of the picture hangs in Center Hall. This post is about our College Cadets which were formed in the late 1850’s, partly as a physical activity for students. 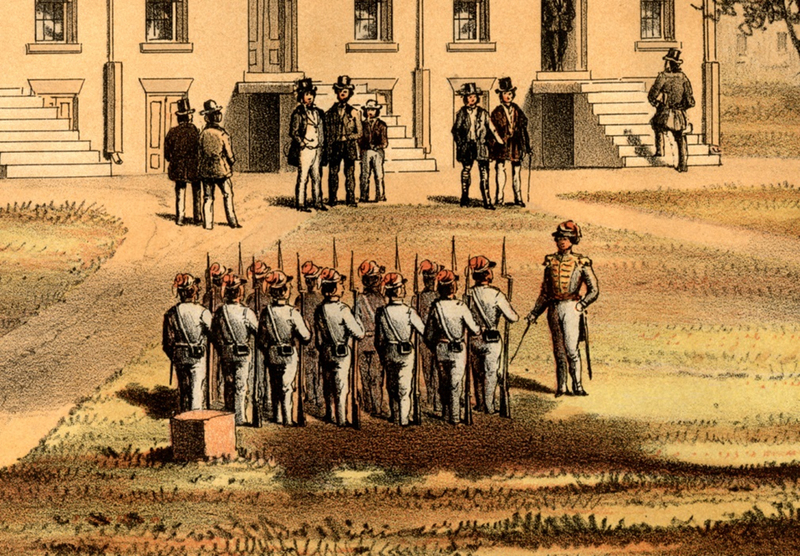 At that time on campus, there were no organized athletics, the College Cadets competed with other drill companies including Lew Wallace’s Montgomery Guards. John J. P. Blinn, Capt. Ozro J. Dodds 1st Lieut. John F. Caven, 2nd Lieut. This Cadet Roll is an original listing of the Cadets and the marks across it note the attendance, or absence, of the members. Zooming in on this image we see the Cadets at drill. More detail comes from a letter from former Cadet John Cleland to President Tuttle of January 1878, “Blinn and Caven were the prime movers in the matter of organization I believe and were the chief officers…WE had what we considered & what I believe was…a fine drill and a considerable esprit de corps…We sure were able to hold our own against the militia Montgomery Guards – an old organization and frequently appeared in public with them in battalion drill. At the head of the column of these Cadets is John J.P. Blinn, the organizer. In the next few days I will share his story of John Blinn and that of John C. Black, two other members of the Cadets. 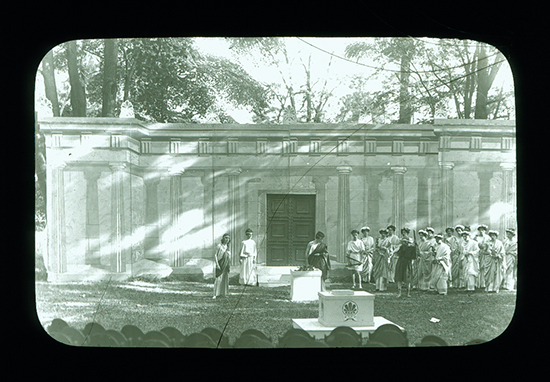 This image is a scan of a glass plate negative of a rehearsal for the play Elektra. Performed during Commencement week of 1912, these plays, there were eight of them, were a yearly ritual for the students of Professor Hain’s Greek classes. Daniel Dickey Hains [W1895] was one of those great alumni teachers and was very popular with his students. He replaced the much loved Zwingli McLain who had died suddenly. In the College’s history, Hains is described as a teacher of great skill and much energy. The study of Greek had been in decline and Professor Hains was on a mission to revive it. He initiated a course to study Greek literature in translation, but even more importantly he began producing a play each year. The Greek play each year was an English translation but presented as accurately as possible. The setting was in the east campus, about where the Martindale dormitory is now. That land forms a bit of an amphitheater setting. The sets and costumes were designed to be as accurate as possible, the glee club sang as the choruses, and some original music was composed for them. It is said that folks would come from quite a distance to see these excellent productions. Elektra even hit the road and played several times at the Winona Lake Chautauqua in 1912. It took a mighty effort and apparently a joint effort, between Professor Hains and his wife, who made the authentic costumes. Of course the students worked hard too. Truly a turn of the last century immersion experience! Let’s start with the buildings shown. At the top of the map in the center is a cross-shaped building. That was the old Polytechnic Building which also served as the Hovey Museum. About midway down the map we see the line of buildings of our historic campus. Starting from the left is South Hall, then Center with its wings, Peck Hall of Sciences (behind this building you see a small square building, the power plant about where today’s flagpole stands) and the Yandes Library. From this combination of structures we know that this map was made after Yandes opened in the early 1890s, but before the Polytechnic was razed to build the new gym and armory in the late 19teens. Note that there is no Mall and no Chapel. These were both constructions of the 1920s. It is interesting to me that several of the sidewalks of today are remnants of the old campus as shown here. The sidewalk that today runs from the Sparks Center and northeast at an angle is the same path as shown here. Also the path from the northeast corner of campus through the Arboretum is the same. Lastly, the rectangles scattered throughout the Arboretum. I believe that these denote the tennis courts of that time. There are other items sketched in here and there. I think perhaps this map was used in planning efforts to modernize the campus or master planning, as we call it today. 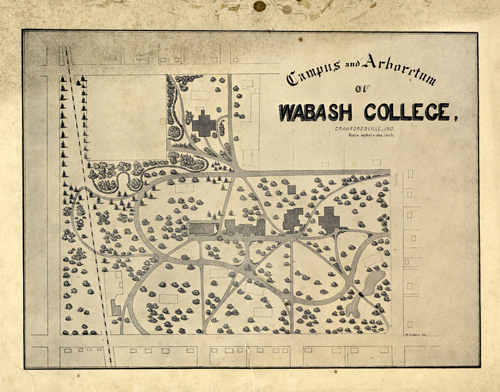 Whatever the reasons, this map has a lot to teach us about Old Wabash and we can learn a great deal about the campus by studying it closely.